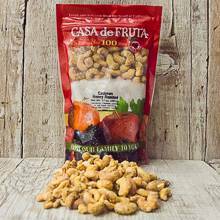 Sweet and salty meet to create this delicious treat - creamy cashews roasted to perfection and then covered in sweet honey and then slightly salted. They one of our favorite snacks, they are sure to become one of yours too. Packaged in a 17 oz. bag.